The lower floor of the new house will be a concrete box, with full height foundation walls on all four sides. These walls will be exposed, so the concrete subcontractor had to take extra care to layout the form boards and the snap tie spacing. They did a beautiful job! Amazingly, the long diagonals are only 1/16” different, meaning it is perfectly square. The tall downhill wall is flat and plumb, a real work of art. We are building this house from recycled materials. The steel rebar is 100% recycled steel. Under the slab on grade, instead of gravel we are using 100% recycled glass, called “cullet.” It comes from the local curbside recycling bins that collect glass bottles. 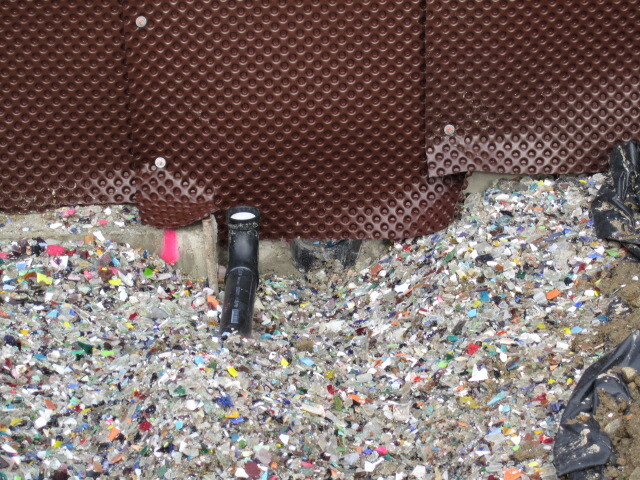 The concrete wall has a brown dimpled drainage mat on the inside, made from 60% recycled HDPE. The concrete mix contains blast furnace slag, a waste product from smelting iron into steel. The slag has the added benefit of reducing the Portland cement from a typical 5-1/2 sacks per cubic yard (517 pounds) to only 2-1/2 sacks (235 pounds) without a loss in strength or durability. Manufacturing 1 ton of Portland cement requires 6 million BTU of energy, so we are reducing our energy consumption before the house is even operational.